(private lake) Vacation Rental #7497 LakeHouseVacations.com Rent Me! The living room is spacious and comfy. How would you like to have the whole lake to yourself, with no other renters around to disturb the quiet beauty or to catch the best fish before you do? You can have all that and more at Scott's Timberline Lake in Southern Indiana. The 10-acre lake is located in a secluded valley off a county road. It's spring fed and naturally stocked with bass, red ear and blue gill. We've seen our guests catch 10-lb. bass in this lake! Pictures in the guest book document that. full week. The cabin sleeps seven comfortably. The 2BR log cabin (use the hide-away bed and comfortably sleep seven), with the large front porch facing forest and lake, has all the conveniences of home -- A/C and heat, full furnished kitchen and laundry. The owner is onsite but far enough away that you'll have your own privacy. Just imagine relaxing on the front porch of the hand-crafted log home, watching some of the local wildlife -- deer, turkey, fox and squirrels, and listening to all kinds of beautiful birds that flock to the feeder just in front of you. Or picture yourself swinging in the large hammock (two comfortably), looking up through the leaves of the trees, watching the clouds float by in a bright blue sky, or delight in the Canada geese when they fly over. See yourself in one of the boats, ready for that catch of a lifetime! You'll find our rates very reasonable. Stay a weekend, a week, or a month in this hidden paradise -- perfect for your family vacation or that long-awaited fishing trip with your buddies. 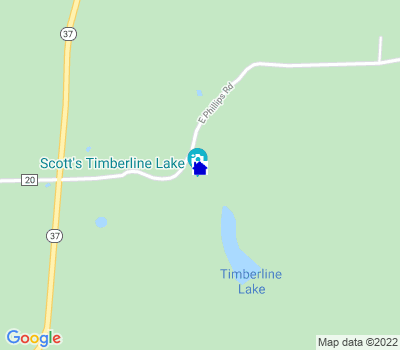 Either way, you'll find Scott's Timberline Lake a place you'll want to return to again and again. Spend the weekend for two for $240, or bring your party of seven for $700. Enjoy the 46 acres for a full week: just $700 for two or $2205 for seven. Our full schedule of pricing most likely includes just the time frame and party size you want; use the email at the bottom of this listing and let us know how many days you're interested in. Or visit our website, indicated later. Full kitchen with all utensils and tableware. Full bath. Sheets, towels and paper products are included. Utility room in the cabin. Large living room and 2 bedrooms. Comfortably sleeps 7 by using the hide-a-bed. Very large front porch for lounging, watching birds and wildlife and talking. Roomy hammock for two under the trees. 46 acres. 10-acre lake stocked with bass, red ear and bluegill. One boat with trolling motor plus a paddle boat, row boat and canoe. Lake is located about 200 ft from cabin and is surrounded by private forest. Fabulous fishing! No firearms. Full service grocery, neighborhood theatre company and restaurants 30 minutes away in historic Corydon Indiana. Downtown Louisville one hour away with museums, Churchill Downs, several live theatre companies, and great restaurants. Golf course located 3 miles away. See our website for full schedule of rates. Two nights minimum. This ad has been viewed 24303 times.